Port-Au-Prince, Haiti, 2010. Collapsed unreinforced building. Photo by Eric Quintero under Creative Commons license. 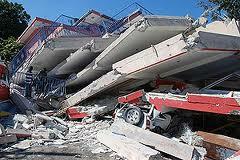 Poor building construction is the highest risk factor you face in an earthquake. Recent studies predict that the next major earthquake in Utah could cause thousands of deaths and tens of thousands of serious injuries—most due to poor quality buildings. You and your family do not need to be a tragic statistic. You can reduce your risk. Professional geologists and engineers in Utah have prepared this Utah Earthquake Safety website to provide basic information to help you understand your risks and make informed decisions about your home, school, and office building to protect those you love. It also provides links to more detailed geologic and engineering explanations. To learn more: What should I know? What should I do?